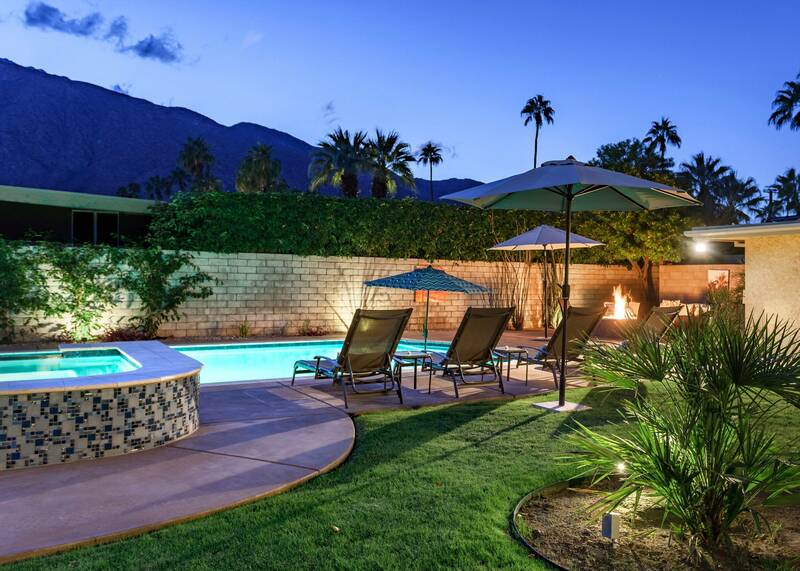 Warm Sands Comfort is located in the popular Tahquitz River Estates area of Palm Springs, only 0.8 miles from downtown! 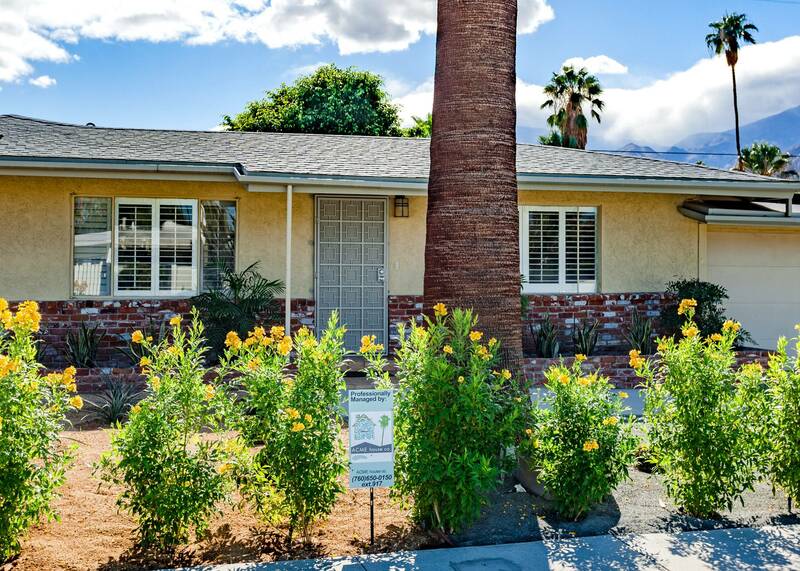 This home has been updated with modern touches throughout and offers spectacular views of the San Jacinto Mountains from the private back yard. 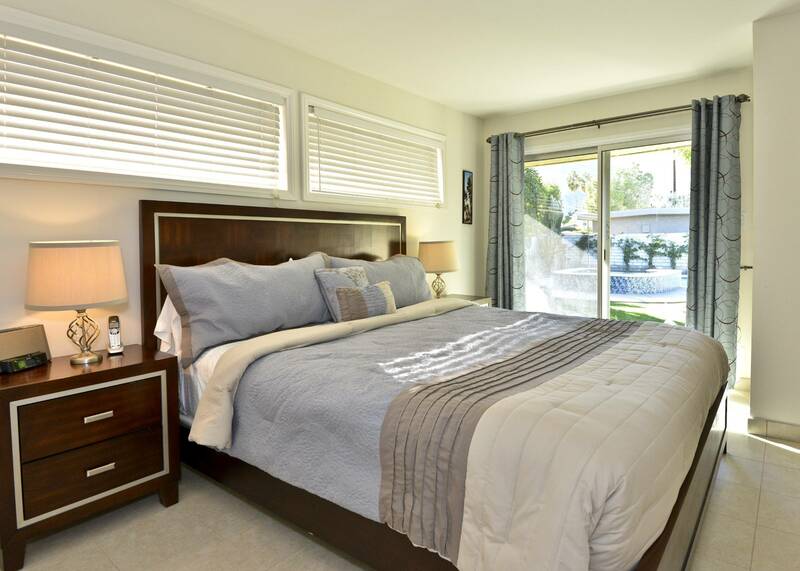 This home sleeps 4 to 6 people (4 adults, 2 children 12 or under), with a California King bed in the master, two twins (which convert to a king bed upon request) in the guest room and a fold-out, full size convertible in the den (3rd bedroom). 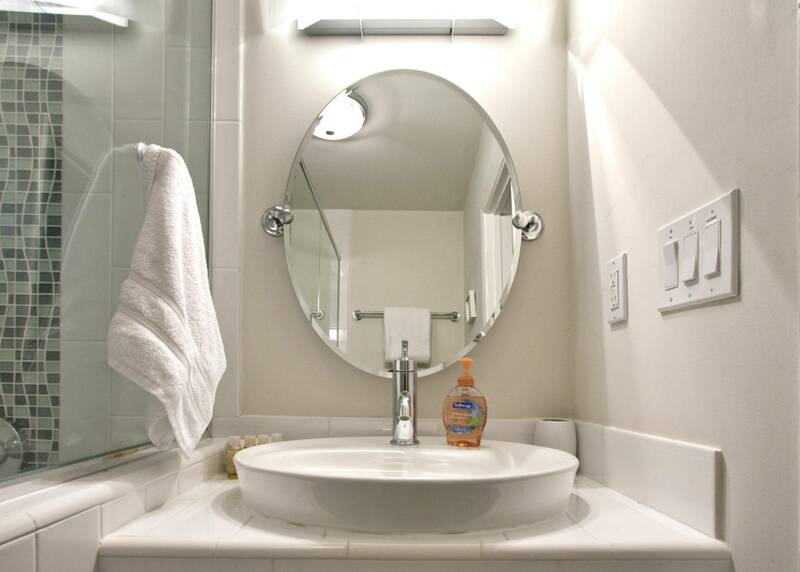 Contemporary glass accent tiles adorn the two newly renovated bathrooms. 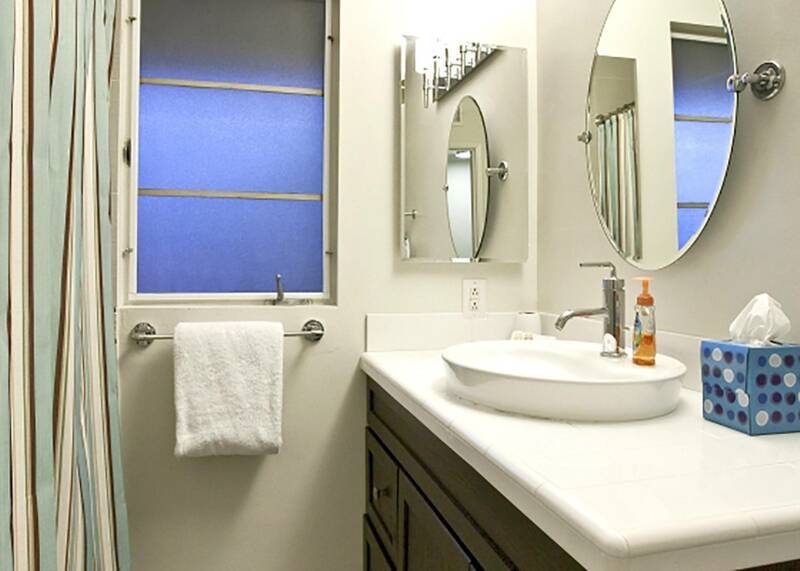 The Master Bath has a two-person shower with frameless glass enclosures and decorative tiles. The guest bath has a beautiful tub/shower combination, also with new tile including glass accents. 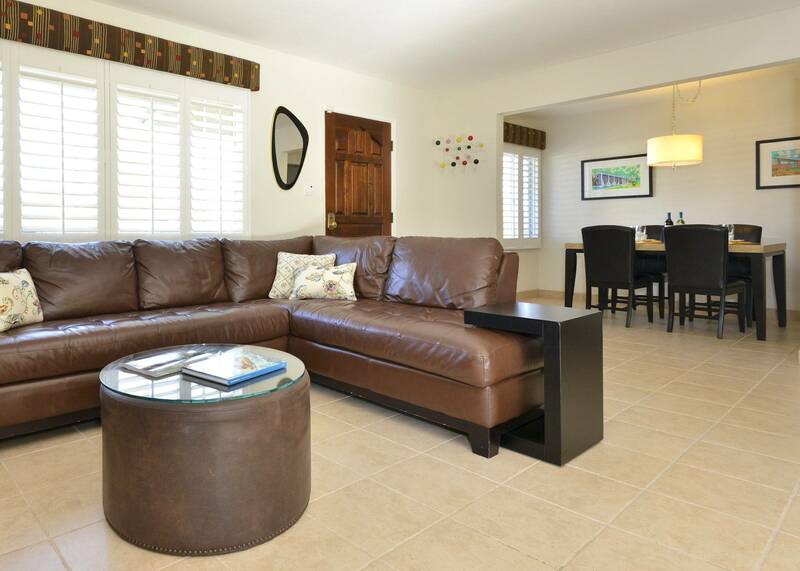 The open floor plan is perfect for entertaining and relaxing both indoors and out. Granite countertops and new stainless steel appliances in the kitchen, which leads to both the indoor dining room and the outdoor backyard patio and garden which is the perfect place to relax, play horseshoes or bocci ball,and take in the view before a dip in the gorgeous salt water pool or soak in the fabulous Jacuzzi hot tub. 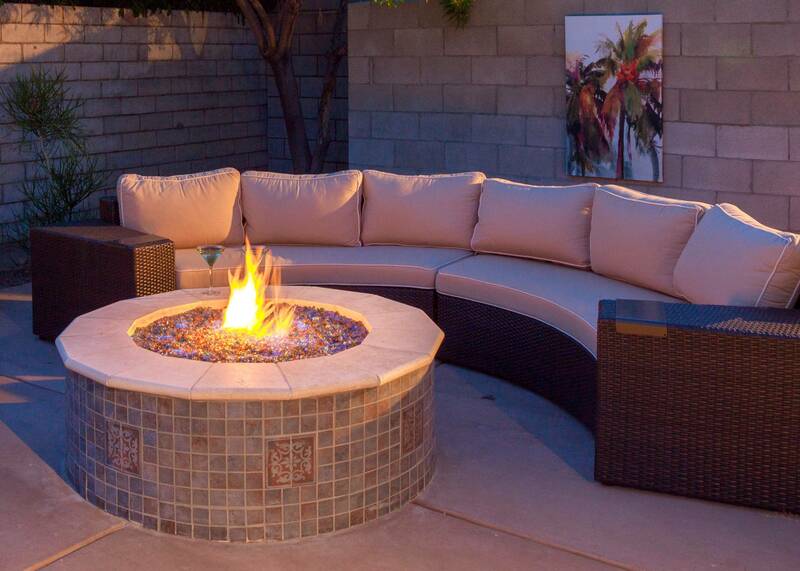 The raised fire pit is perfect for evening gatherings. 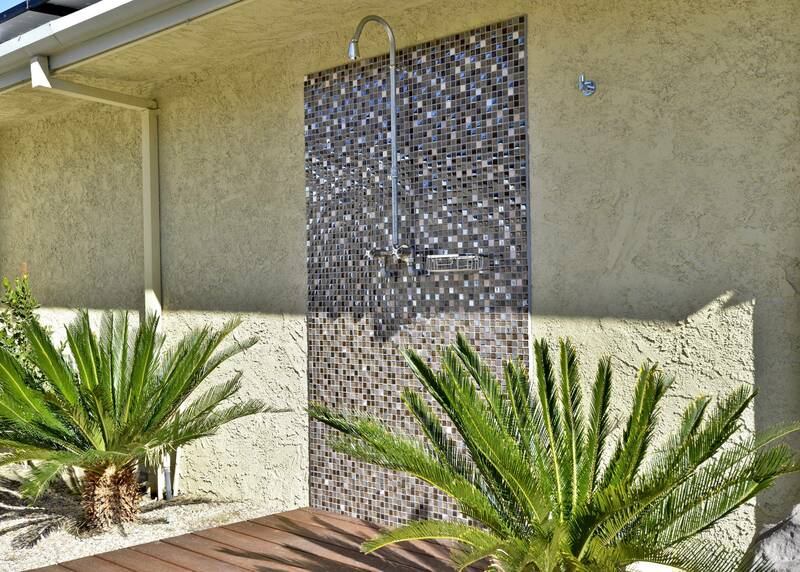 The new outdoor shower is an added plus. Pick your own oranges, lemons, grapefruit, and figs from the mature fruit tree orchard (seasonally) right in the back yard. The living room, den and both bedrooms all have flat screen televisions for those rare moments you won't want to be outdoors! 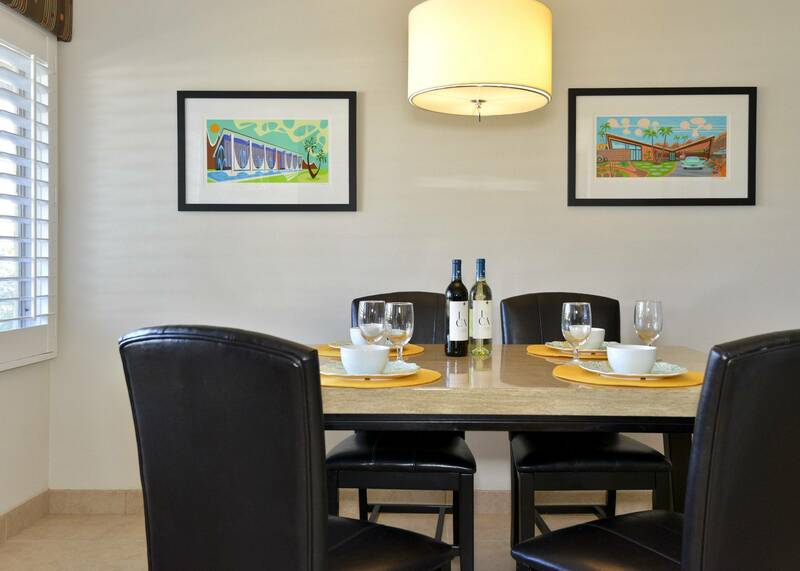 Warm Sands Comfort is located on a quiet street, with golf courses, hiking, sightseeing, amenities, restaurants, shopping and nightclubs as well as downtown Palm Springs and the Spa Resort Casino all nearby. 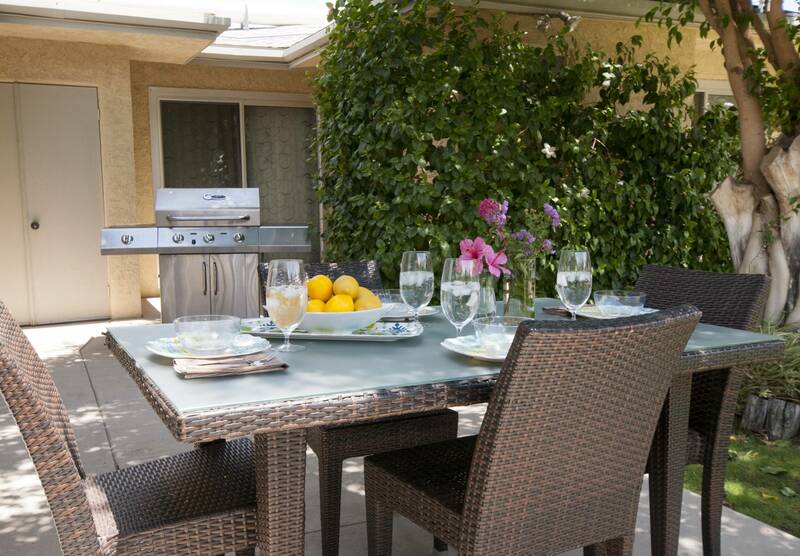 "ACME House Co. knows how to make the vacation rental an easy process! You can predict the high quality of their homes. You will have nothing to worry about and be able to enjoy your holiday! This is my second time renting, and I am in the middle of booking for a third time! 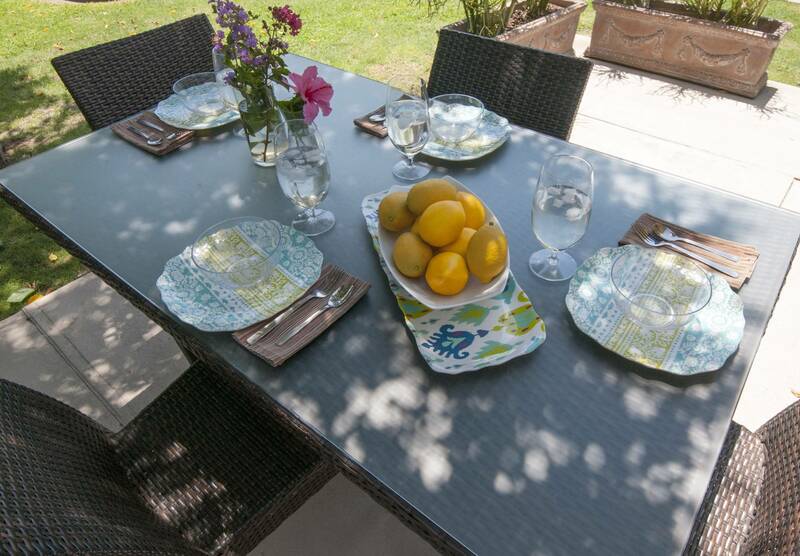 I like the comfort of knowing that your homes are clean, stylish and make my holiday relaxing! Our fabulous backyard with pool, hot tub, fire feature, outdoor shower and mountain views made our vacation! Your houses are represented honestly on your web site. I have rented many vacation homes all over the world and I have to say Acme has the best and easiest system for renters! Your organization and awesome communication with guests take all the stress out if the rental experience! Thank you! I will be back to visit again soon!" 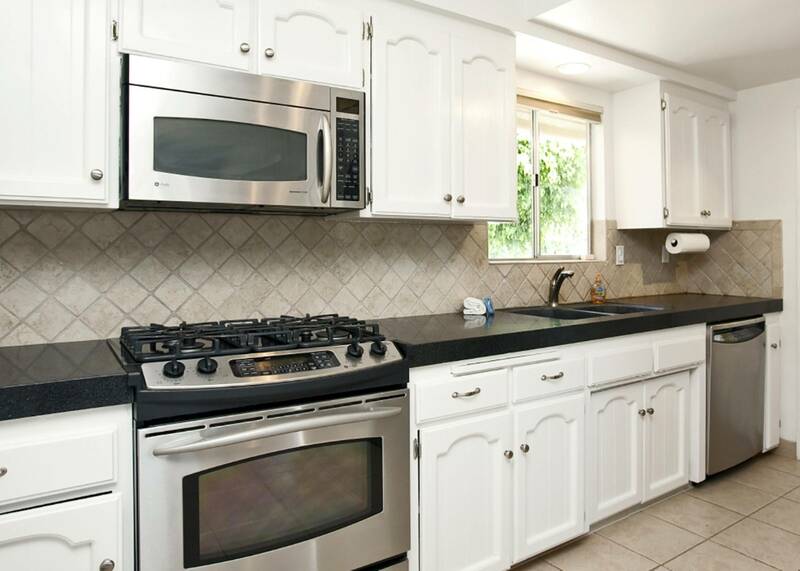 "Comfortable, warm welcoming home with all the little extras in the kitchen and outside. Great place to feel like you never left home! My 17 year daughter choose it for the saltwater pool and fireplace. Loved the privacy for me and my kids who all have been away at school. It was a wonderful desert time experience, and we would do it again. " 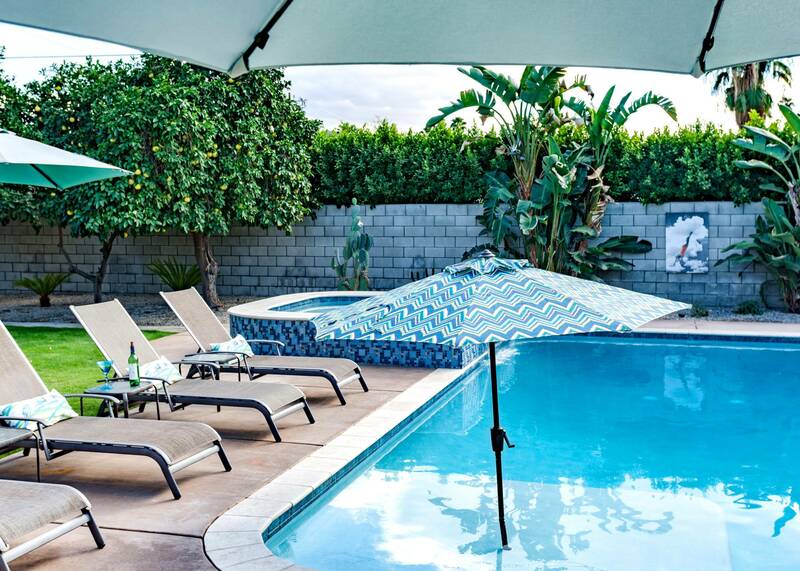 "The pool, house and personal service gave us hope that the photos would match the vacation experience.....and it did! 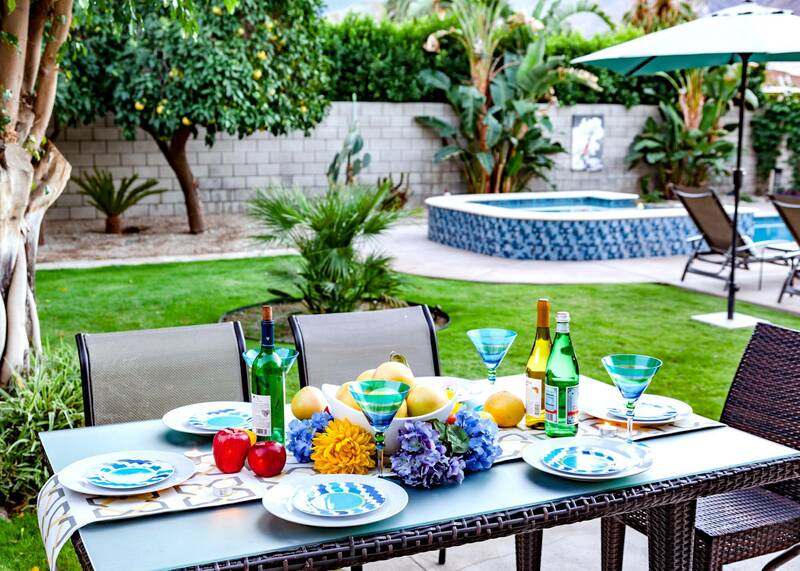 The best part was the the pool, yard & kitchen. Biggest surprise was the large size of the yard & pool. Had a wonderful time, didn't want to leave. " 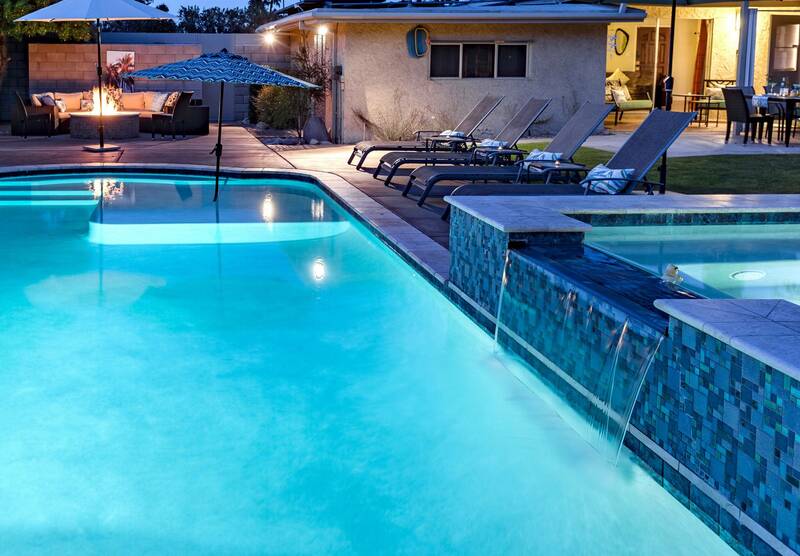 "Loved the pool, grilling, hot tub, and fire pit areas the most! The inside of the home was updated and comfortable. The best part was the pool area and the remote control for the pool area. The home was in great condition and clean. 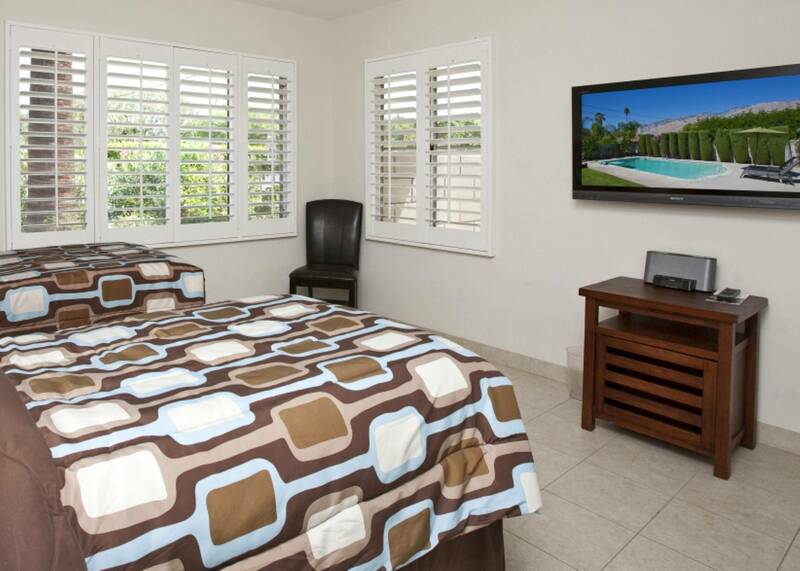 Nothing was terribly wrong, and the stay was very enjoyable." "Not sure how many times we have stayed here lost count. This is a cute well stocked home. Location is GREAT even though we never leave the home! ACME has been very accommodating to us every time we booked this home. Hope to be back soon." "Easy communication with ACME House Co.! The accommodations were better than expected, and we were well cared for while here. 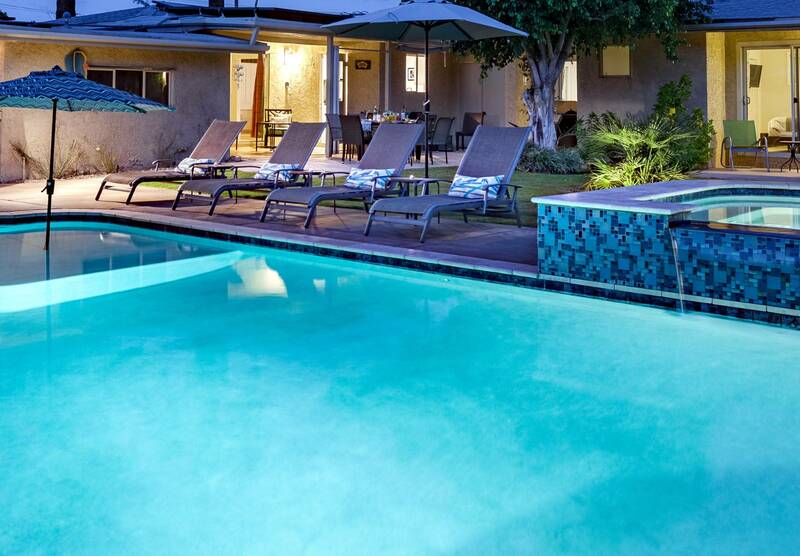 The best part was the location, and perks of the accommodation, especially the heated pool!" "My friends and I planned a weekend getaway and fell in love with this little house. When we arrived we were blown away by the beautiful backyard. Everything you could possibly need for a summer day was available at our fingertips. I really loved how the pool had a slot for an umbrella. It definitely came in handy in the 100 degree weather! We ate in everyday and the kitchen was fully stocked with everything you could possibly need from pans to forks and knives. 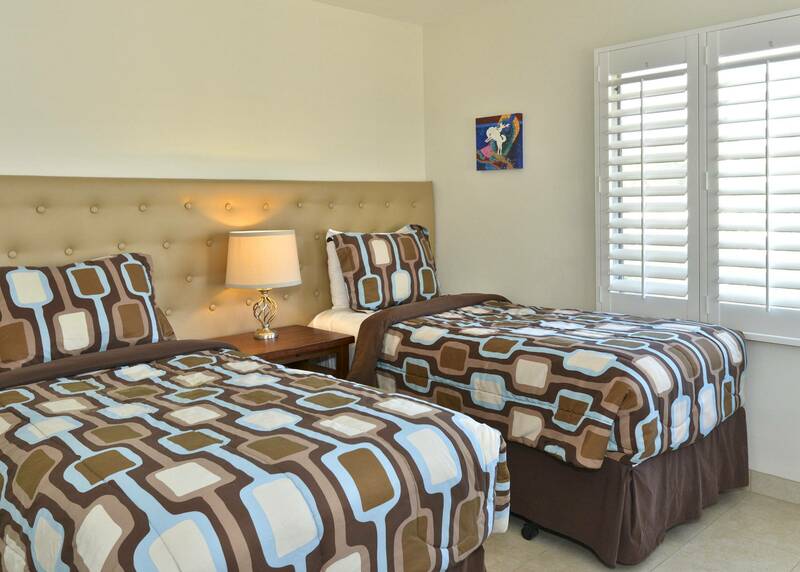 The rooms were very spacious and very clean, they even provided us with beach towels. We had such an amazing weekend and will definitely be renting from ACME House again!!!" "This is a cute cute house. The pool is great, shower outside. Nice pretty well kept lawn. Everything you need in the kitchen. TVs in all rooms. Comfy beds. 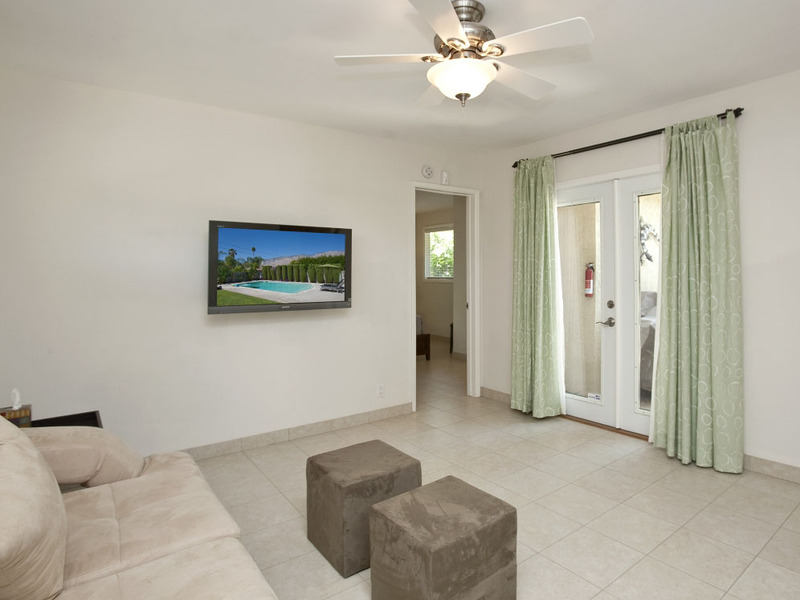 Master room has a sliding door leading to the backyard with a little patio area. 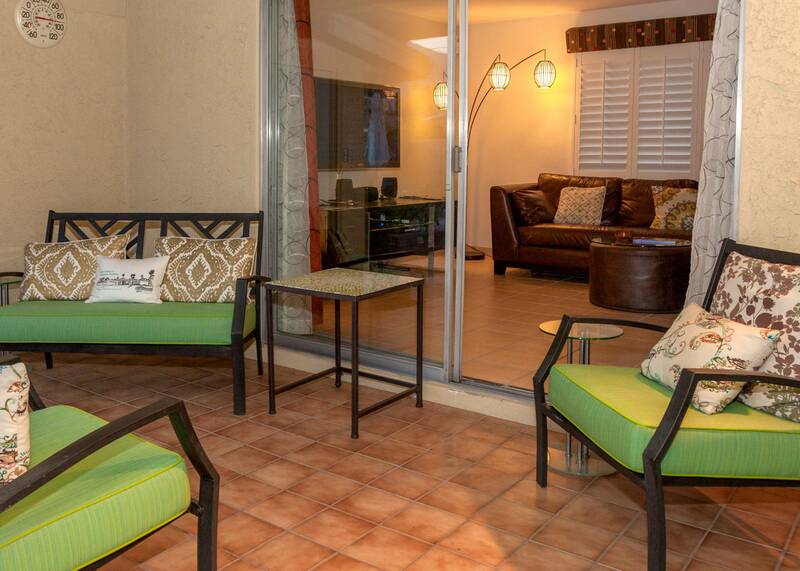 There is a nice covered patio area right outside the kitchen and living room area. We will be BACK!!" "Best vacation rental management company we've worked with. We booked a week out from our trip and were looking for price flexibility, which you allowed and others did not. Liked the well organized welcome book, and found the home very clean. Unfortunately, the hot tub did not go above 102, despite trying everything in the instructions to heat it up. Overall, a very good time was had by all!" Manager Response: Thank you Putnam. So glad you enjoyed your stay. You may not know this but the highest temp allowed by the state of California for the spa is 103. 102 is considered a safe temperature for use in any spa and that temp can be found trough out all of our homes. We hope this clears things up for you and we look forward to having you stay with us again. Don't forget to use you past guest discount code when you make your next reservation. "Great service from start to finish. Chose this property for the ease of working with ACME House Co. making reservations, and what the house had to offer. Th best part of the property was outside area. " This Place Keeps Getting Better! "We've stayed here a few times before and liked it. But now we LOVE IT. 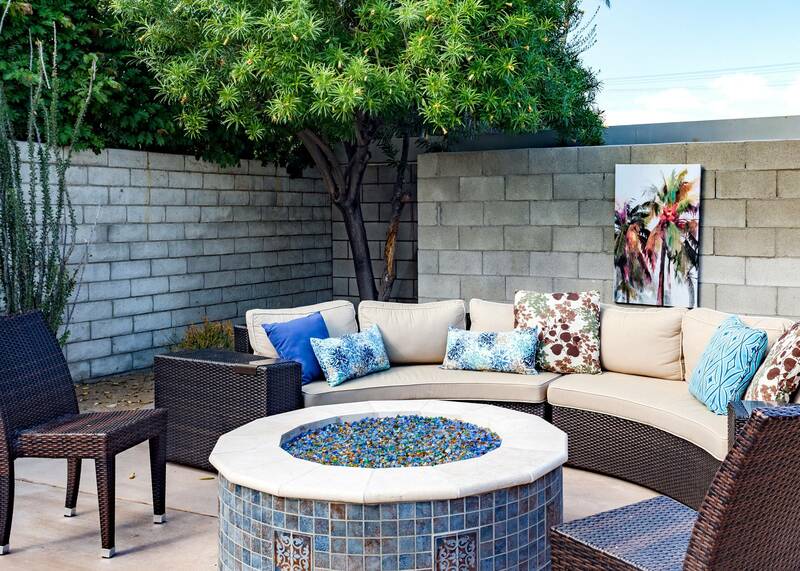 Recent improvements like the outdoor living room and firepit were perfect. 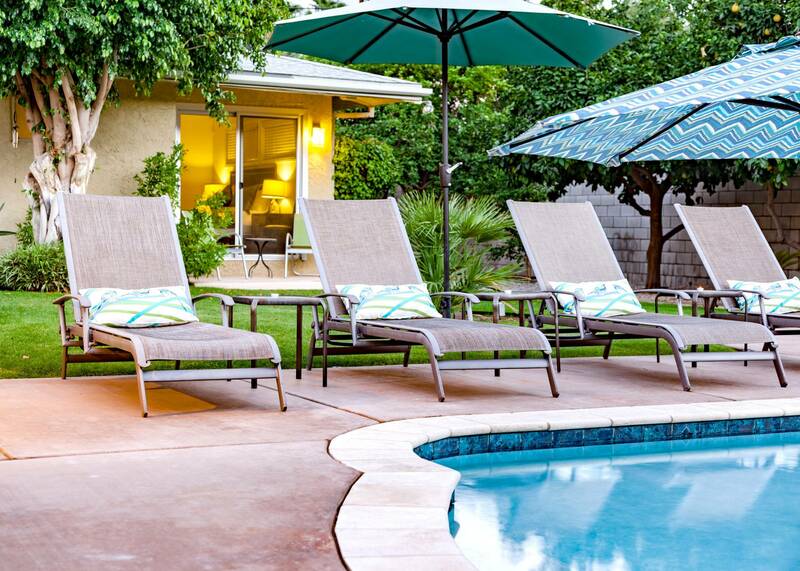 We love the location - the house is adorable in a mid mod way - and now the pool yard feels like our own mini resort. We will be back!" Manager Response: Thanks for your feedback Nadine. Yes - this property owner has taken this house to the next level with the recent outdoor improvements. "We visited this property once before when friends stayed here. 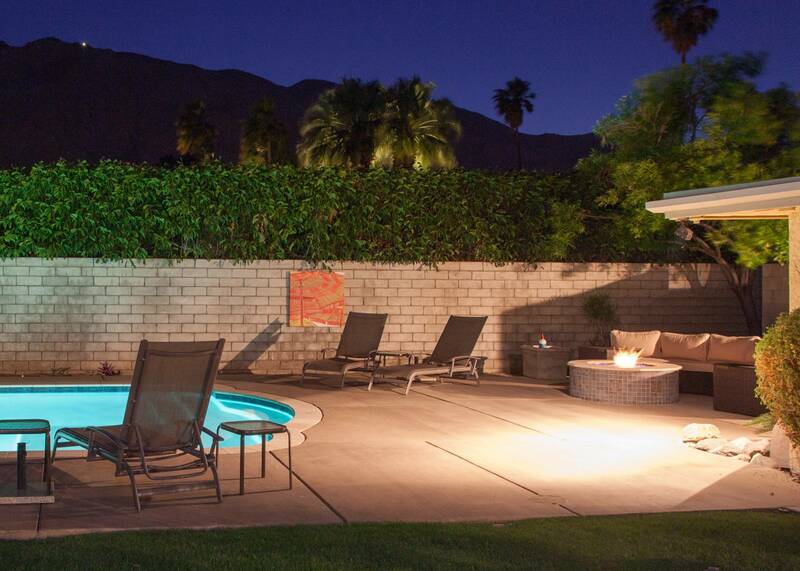 We liked it so we rented it for ourselves when we decided to come back to Palm Springs. We were so surprised by all the upgrades. 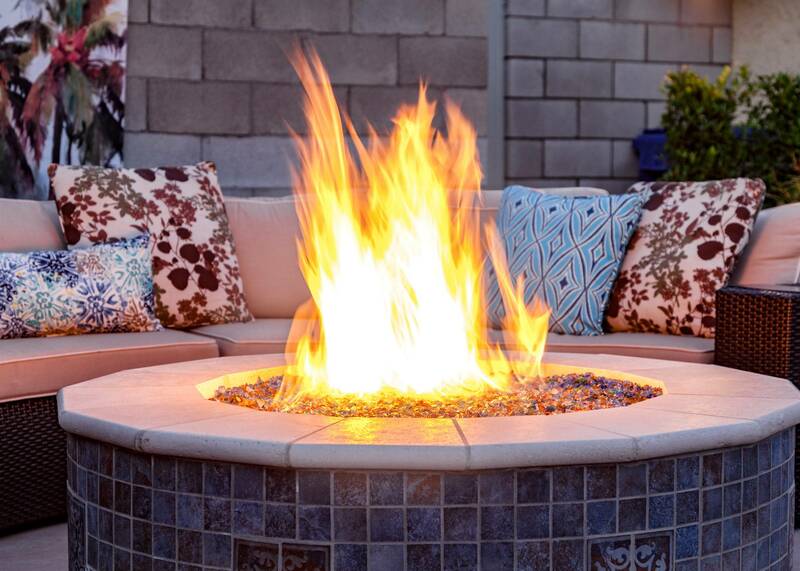 The new beautiful big built in hot tub was perfect.The new fire pit and outdoor living room was just great. My favorite part was the new outdoor shower. Thanks for making a great home - near perfect. Oh and thanks City of Palm Springs! The new shuttle service around town is a major improvement. The shuttle stops were just a short stroll from the house. Really convenient! " 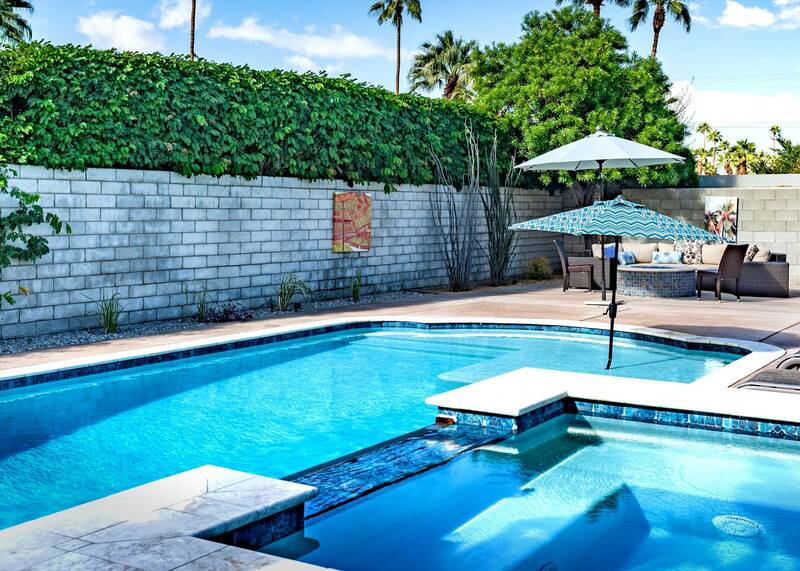 Private Pool and Deck Space! "We had a great time at this property! 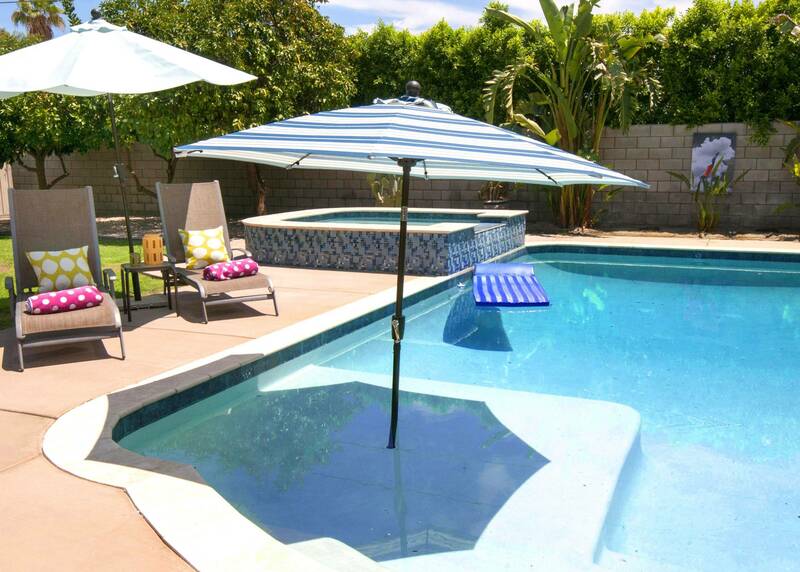 Great yard with pool, fruit trees, grassy space and outside shower. The house was very clean upon our arrival. The house met all of our needs and we loved that it included Wi-Fi. Our expectations were met and we would highly recommend your property to friends! " "Very good overall! We didn't even look at any others. we saw this and liked it! Would suggest grab rails at poolside for older people, like in the spa." 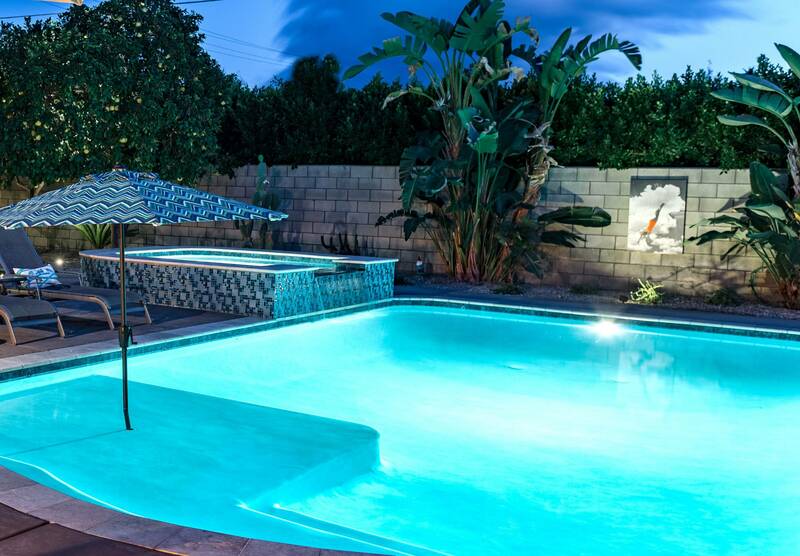 Great hot tub and pool and very private backyard! 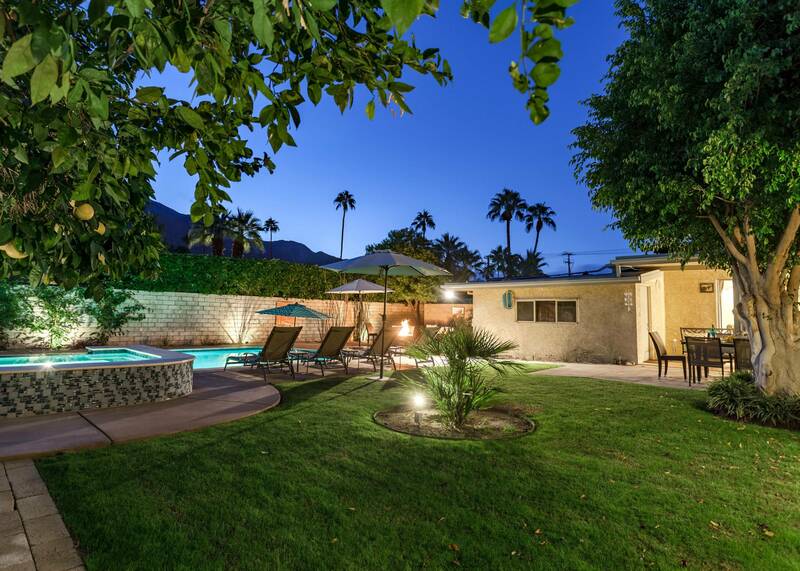 "Large yard with great fruit trees. Great location and amenities. Excellent arrival experience. Very professional service. The only difficulty we had was trying to operate the TV remotes. The good thing about that is we spent more time in the great hot tub! We rate the comfort, style and cleanliness of Warm Sands Comfort all very good. 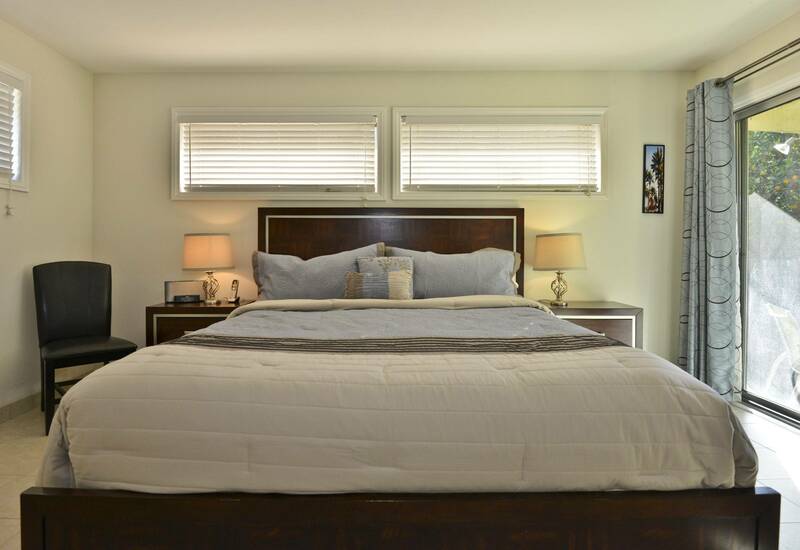 We recommend Acme House Co."
"Warm Sands Comfort had everything we needed & was very clean. Very comfortable cozy home with beautiful backyard & view! 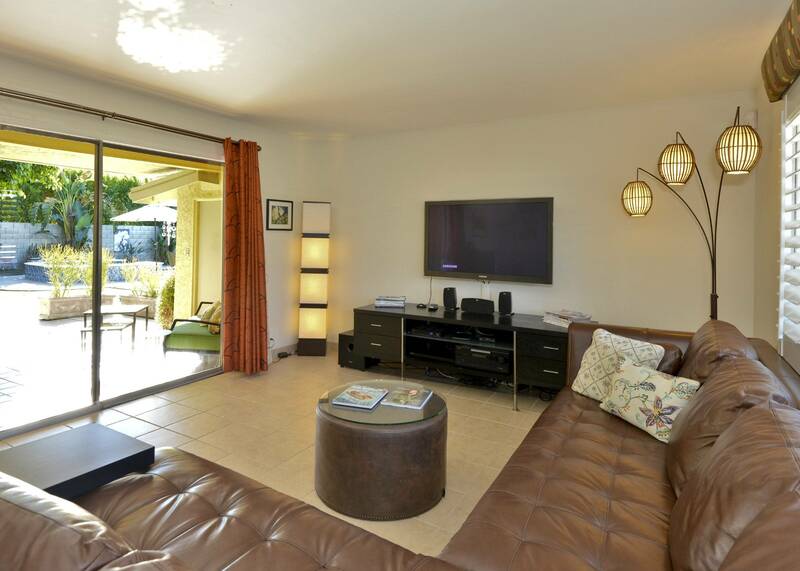 We chose this property because we had rented this home last year & definitely wanted to stay in same one again!" 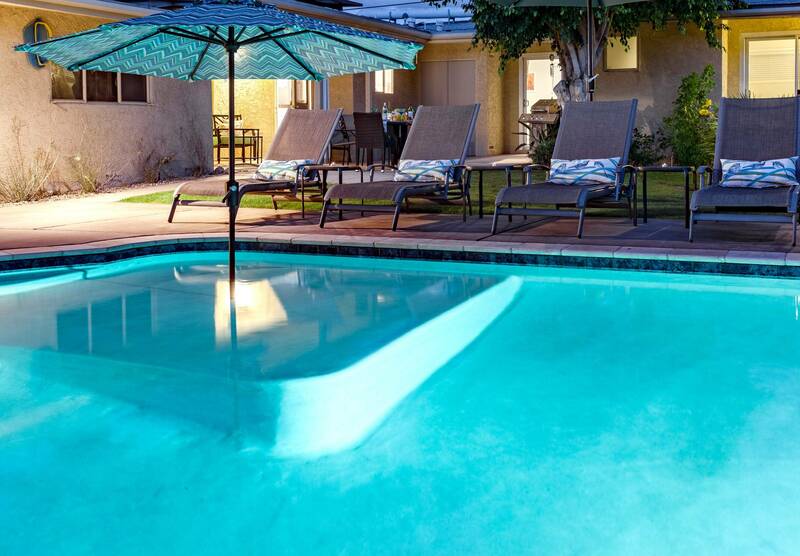 "Comfortable and clean, great pool, great service, nicely stocked kitchen, easy to find. Warm Sands Comfort was close to downtown, had the right amount of space for our party, and had a nice pool. We were surprised to find fresh lemons from the trees in the yard. "